Usually this refers to a low/no power descent which requires little effort. 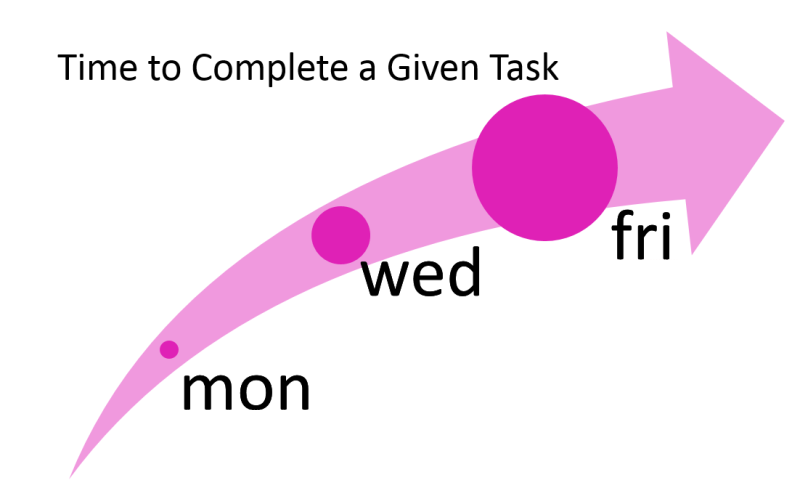 Applying this concept to the work we do essentially means doing the harder/boring/tougher/difficult/unpleasant things earlier in the week so that towards the end of the week we are “gliding”, with less effort required as we’ve already done the worse tasks. In addition to applying glide paths to the week, we can apply this to individual days: doing the tougher things at the start so as we get closer to finishing for the day, our tasks get easier. The same thinking can also be employed by agile teams, for example doing the harder things earlier in the sprint. This is not always the case obviously, everyone has different energy patterns, but becoming more self-aware we can apply ourselves to different kinds of work at the times where we get get the most output. Also it’s interesting that it may be better to do tasks requiring creativity when we’re tired. Glide paths assume that we have some autonomy over the prioritisation of our tasks, even when we do have autonomy we my have little choice sometimes about when things get done. Even so, glide paths are a useful concept to have in our productivity toolboxes.